Whether you’re traveling solo or with a group, in the city or countryside, at a restaurant or museum, you are not immune to the inevitable encounter with pick-pocket or petty theft. What’s ironic to me is the lack of awareness when one is distracted by foreign surroundings, and how creative the “opportunists” can be. The best we can do is to blend in and keep our valuables out of sight, easy to reach and well hidden. Fanny pack is practical, but probably not the go-to tool for travel ninjas. This wrap contains a securely hidden zipper pocket big enough to inconspicuously store your cell phone, keys, passport or cosmetics. 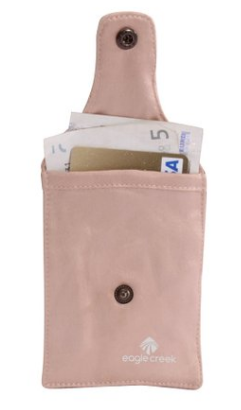 Perfect for travel, shopping or a night out where you’d rather be purse free! This diverse infinity wrap can be styled as a scarf, shoulder wrap or head wrap and can even fold into a clutch. 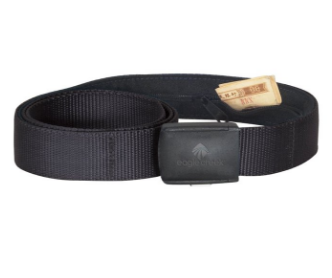 Looks like a regular belt, works like a regular belt…but it acts like a money belt, giving you added travel security during your travels. 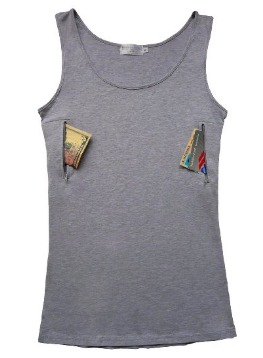 A discrete under clothing solution designed to keep cash and cards out of sight. 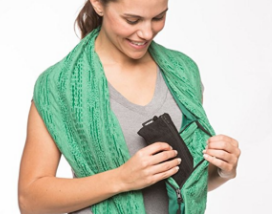 Just snap it over your bra strap to provide close-to-body security. It’s made from a silky smooth, breathable, washable natural silk and has a moisture-resistant lining. Made by Eagle Creek. There is no place too private (is there?) when it comes to protecting your valuables. There’s even a thong version of this. The Pocket is approximately 6×6 inches (Varies by size)- fit emergency cash, credit card, ID/Passport, and other valuables. The pockets are just the right size for a passport and can comfortably hide credit cards, id cards, drivers license and cash too. Only you will ever know the pockets are there, they say. The pockets fit passports, and there is ample space for credit cards, cash, id cards, drivers licenses and other valuables you just don’t want to lose on your travels. 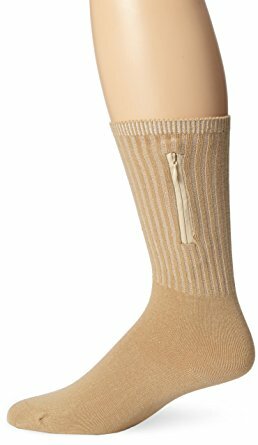 One zippered compartment per sock gives you ample room to secure your necessities. Made by Travelon.